Martha Washington Candies may have a funny name, but there's nothing funny about their great taste! These traditional chocolate-dipped cream candies are a snap to make, and have a sweet cream filling that's packed with shredded coconut and toasted pecans. Prepare a baking sheet by lining it with waxed paper or parchment paper. In a large mixing bowl, beat together the butter, powdered sugar, salt and condensed milk until the mixture is light and fluffy. With the mixer on low speed, add the coconut, pecans, and vanilla extract, and mix until well-combined. The mixture will be stiff. Place the candy in the refrigerator to chill until it is firm enough to roll into balls, 2 to 3 hours. Using a candy scoop or teaspoon, form the mixture into 1-inch small balls and place them on the prepared baking sheet. Dust your hands with powdered sugar as necessary if they get too sticky. Place the candy back in the refrigerator to chill while you prepare the dipping chocolate. Place the chocolate in a large microwave-safe bowl and melt in the microwave, stirring after every 30 seconds to prevent overheating. Stir until the chocolate is entirely smooth, and allow it to cool slightly until it is warm but not hot. Using dipping tools or two forks, dip the candies in the melted chocolate. Let the excess drip back into the bowl, then place the dipped candies on the baking sheets. Repeat until all of the candies are dipped. If you want to add the white stripes, melt the white chocolate candy coating in a small bowl in the microwave. Drizzle the coating over the finished candies by waving a chocolate-dipped fork over the candies. 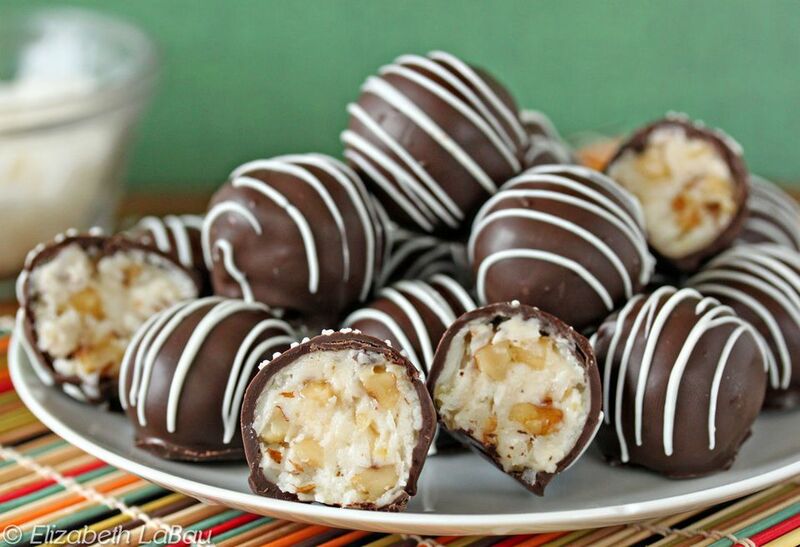 Alternately, you can place the melted coating in a plastic bag and snip off a small corner of the bag to form a homemade piping bag and drizzle thin lines of white chocolate over the dipped truffles. Refrigerate the candies until the coating is firm. Martha Washingtons can be stored for up to two weeks in an airtight container in the refrigerator. For the best taste and texture, bring them to room temperature before serving.